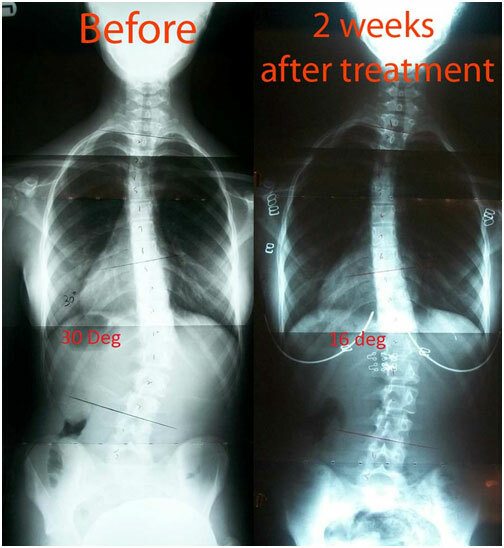 This 13 year old female came in with a 79º thoracic and 91º lumbar scoliosis Cobb angle, and was able to be reduced down to a 66º thoracic and 74º lumbar Cobb after only 6 weeks with our basic treatment (this was not an intensive care case). 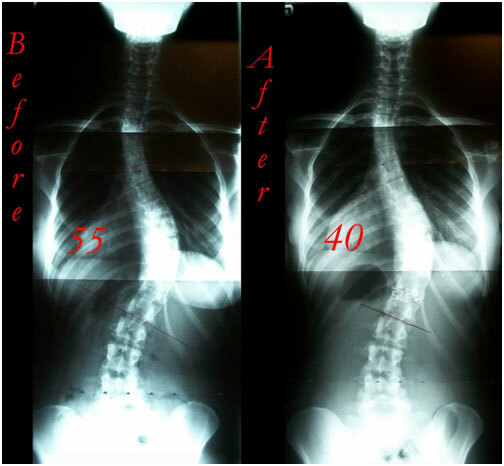 Over the course of one week with our treatment this 34 year old female patient was able to decrease her Cobb curvature from 47º to 32º. 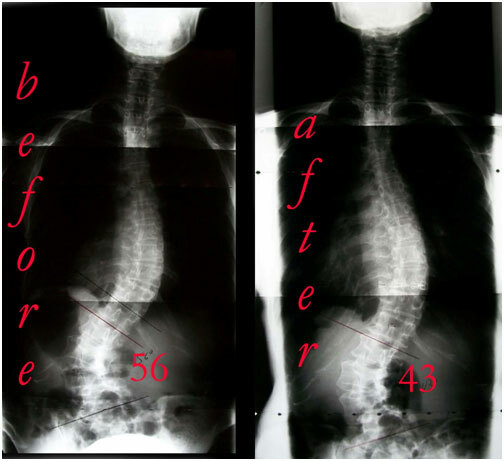 Over the course of one week with our treatment this 24 year old female patient was able to decrease her Cobb curvature from 55º to 40º. 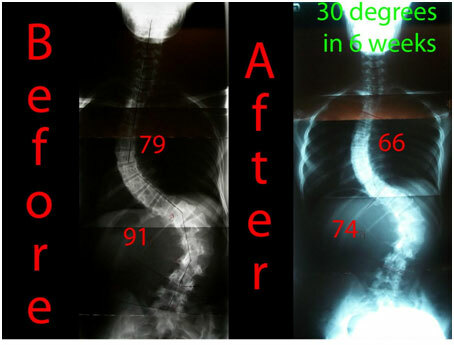 Over the course of 2 weeks with our treatment this 18 year old male patient was able to decrease his Cobb curvature from 52º to 35º. 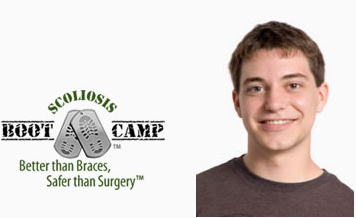 Over the course of one week with our treatment this 14 year old male patient was able to decrease her Cobb curvature from 23º to 12º. 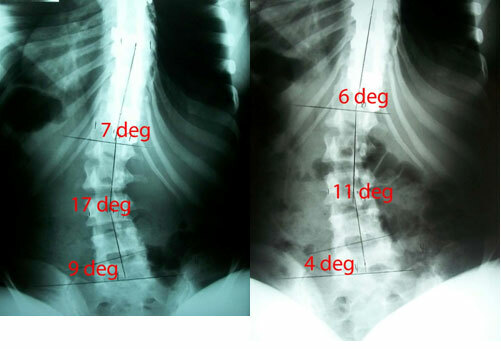 This 18 year old female came in with a 64º thoraco-lumbar scoliosis Cobb angle, and was able to be reduced down to a 49º thoraco-lumbar Cobb after only 8 weeks with our treatment. 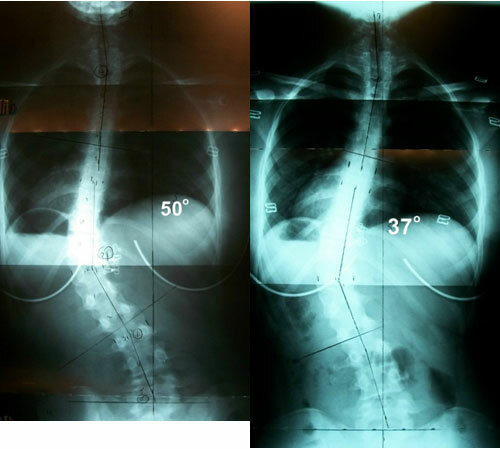 This 17 year old female came in with a 44º thoracic scoliosis Cobb angle, and was able to be reduced down to a 30º thoracic Cobb after only 6 weeks with our treatment. 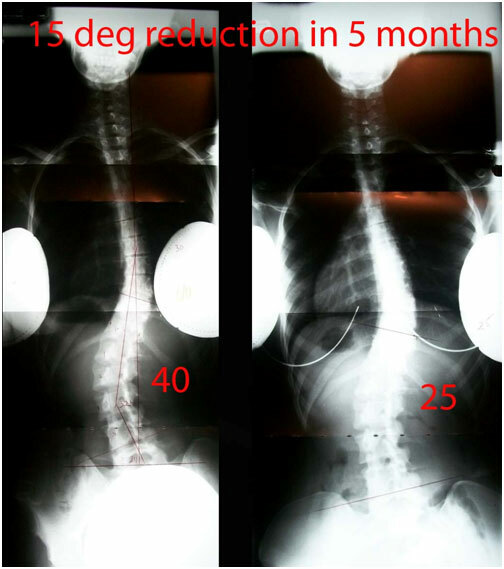 This 12 year old female came in with a 57º thoracic scoliosis Cobb angle, and was able to be reduced down to a 47º thoracic Cobb after only 4 weeks with our treatment. 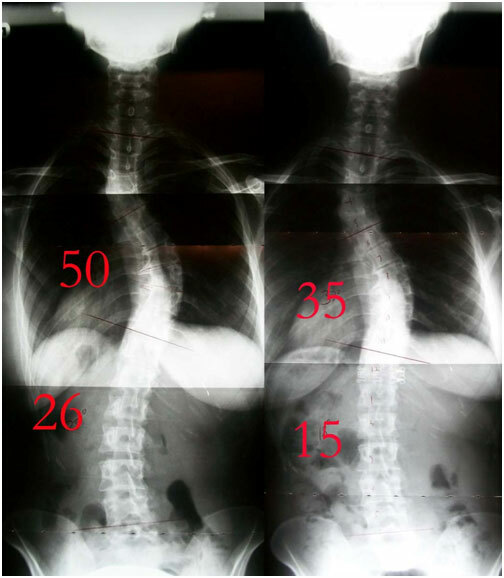 This 18 year old female came in with a 39º thoraco-lumbar scoliosis Cobb angle, and was able to be reduced down to a 25º thoraco-lumbar Cobb after only 2 weeks with our advanced treatment. 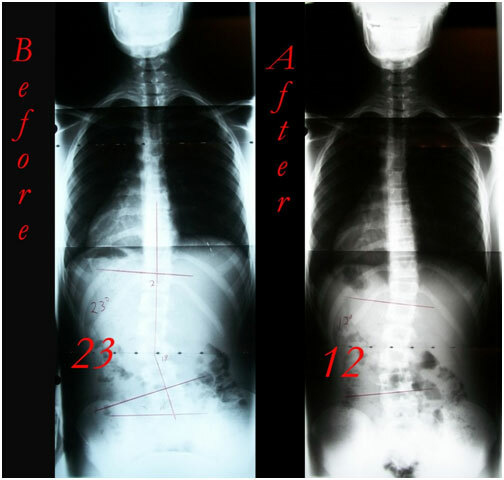 This 33 year old female came in with a 42º thoracic scoliosis Cobb angle, and was able to be reduced down to a 29º thoracic Cobb after only 1 week with our advanced treatment. 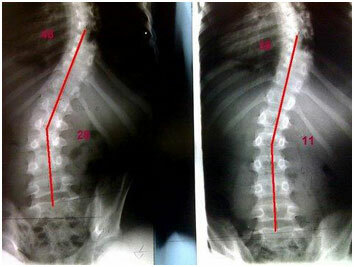 This 18 year old female came in with a 40º thoraco-lumbar scoliosis Cobb angle, and was able to be reduced down to a 32º thoraco-lumbar Cobb after only 2 weeks with our advanced treatment. 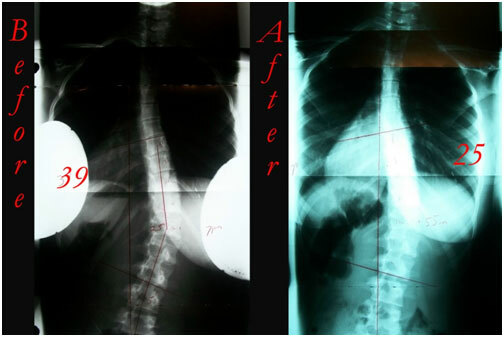 This 56 year old female came in with a 56º lumbar scoliosis Cobb angle, and was able to be reduced down to a 43º lumbar Cobb after only 6 weeks with our basic treatment (this was not an intensive care case). This was over the course of 3 months. 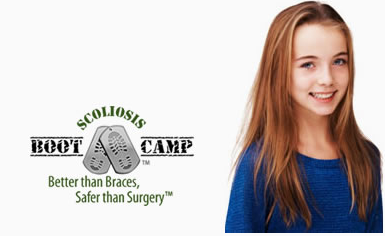 I came to Esprit Wellness to seek non-surgical scoliosis treatment. 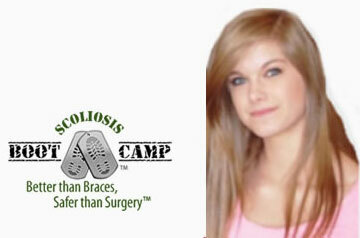 In the past several years, I have had several different medical problems which were not related at first glance. My blood tests constantly showed low red blood cell counts and white blood cell and infection. 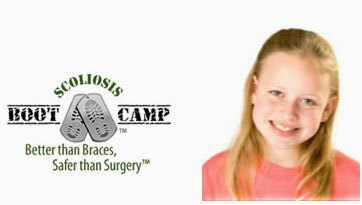 I’ve had cataracts and blurred vision, which was a little too early to start with my age. I had indigestion that caused malnutrition as well as allergies. But the most difficult problem for me was stiffness of finger joints and muscle because I’m a pianist and the problem had already affected my playing. I was told that those came from arthritis and it was normal wear and tear. 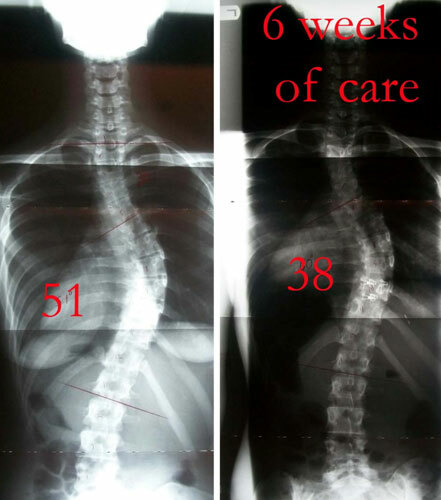 I had never been diagnosed with scoliosis in my life until a recently-taken MRI for liver screening showed a severe curve of the spine. 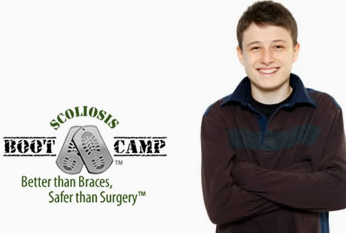 All my past doctors were internists and had tried some treatment to handle each problem separately, but these treatments usually were not very effective for long. 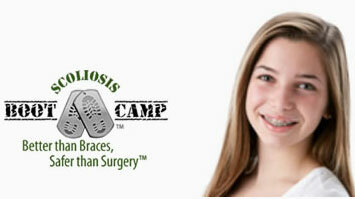 I started a 6-week treatment program after an initial consultation. 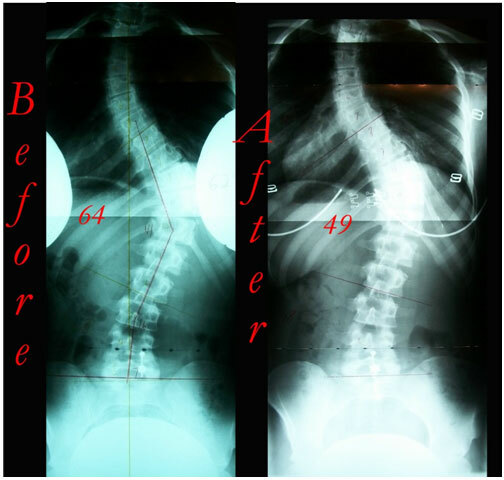 In my case cob angle was 56 degrees so I did not expect immediate relief but surprisingly right after the first treatment I felt a definite change in my vision, backache and hands. 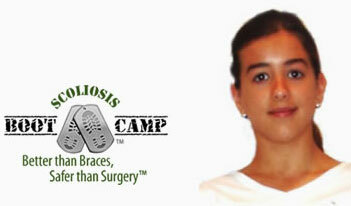 In a few weeks I started to feel much more energized and other problems also continued to be improved. I’m finally freed by all problems and I feel so much happiness every day. That was only made possible by Dr. Sid and his all the staff. 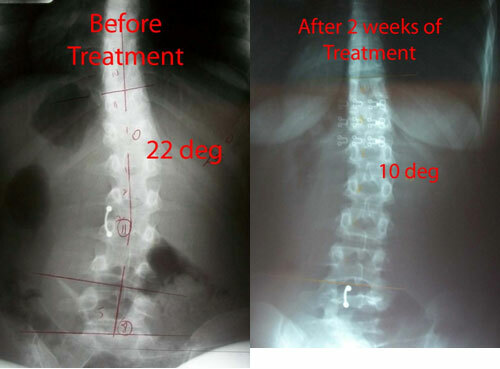 I just went through 6 weeks treatment and the second X ray showed significant improvement. 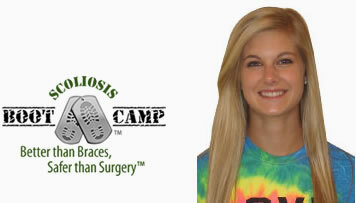 I’m still in the middle of treatment and I believe I can expect more progress in future. 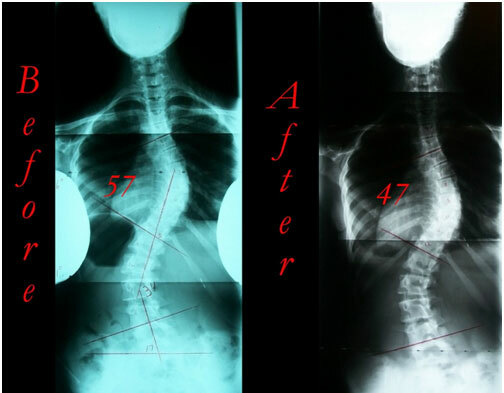 This 40 year old female came in with a 40º scoliosis Cobb angle, and was able to be reduced down to a 25º scoliosis Cobb after only 2 weeks with our treatment. 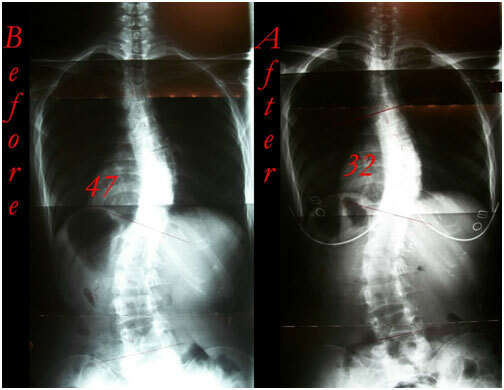 This 37 year old female came in with a 50º thoracic and 26º lumbar scoliosis Cobb angle, and was able to be reduced down to a 35º thoracic and 15º lumbar Cobb after only 6 weeks with our basic treatment. 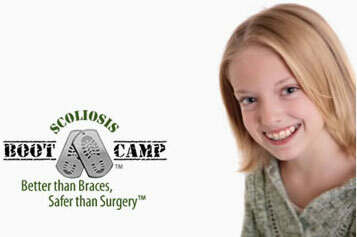 This 12 year old female came in with a 30º Cobb angle, and was able to be reduced down to a 16º Cobb after only 2 weeks with our treatment. 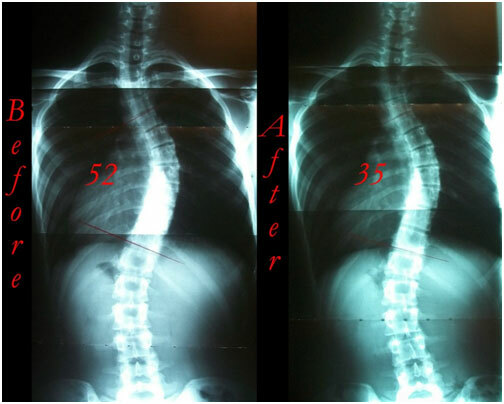 This 30 year old female who had the rods put in when she was young. 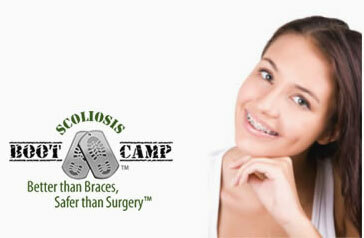 These results are after 2 weeks of treatment. 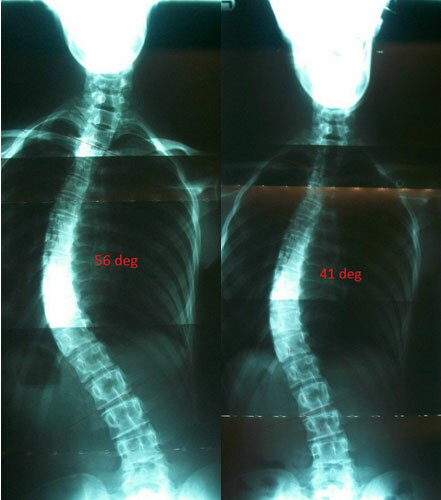 During our 2 week intensive care program this 13 year old female patient decreased Cobb curvature from 50º to 34º, while dramatically improving posture. 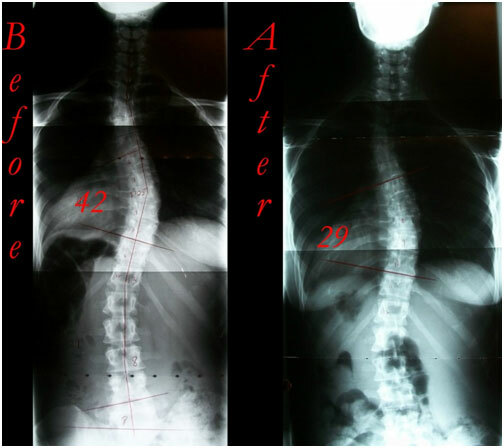 This 22 year old female came in with a 22º lumbar scoliosis Cobb angle, and was able to be reduced down to a 10º lumbar scoliosis Cobb after only 2 weeks with our treatment. 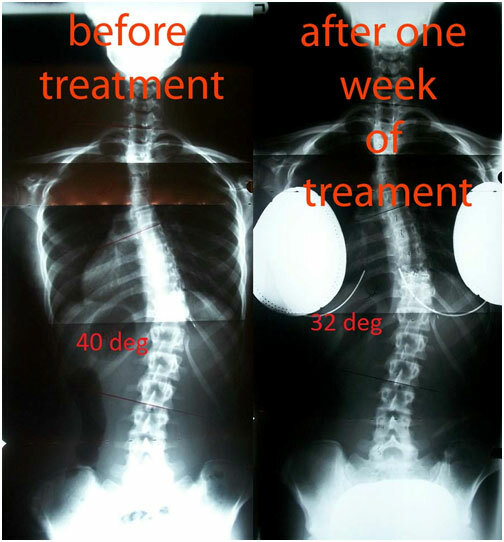 This 17 year old female came in with a 56º scoliosis Cobb angle, and was able to be reduced down to a 41º scoliosis Cobb after only 6 weeks with our treatment. 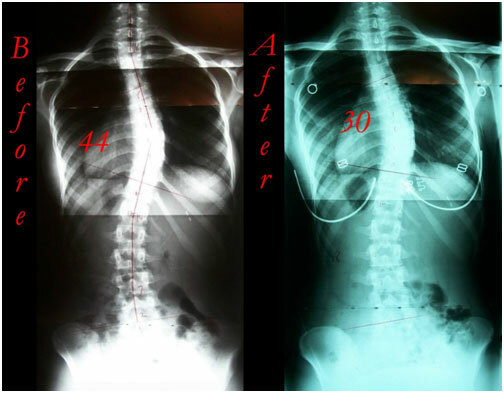 This 25 year old female came in with a 51º scoliosis Cobb angle, and was able to be reduced down to a 38º scoliosis Cobb after only 10 weeks with our treatment.